Whenever I develop a simple project that relies on readily available thrift store items, I get an extra charge of satisfaction. And this Halloween-themed project is no exception- while I was at my local Goodwill, I simply couldn’t get away from these wicker / rattan paper plate holders- there were a TON of these in the housewares section. Growing up, I ate meals at plenty of homes that had these on hand. Designed to support a standard paper plate, they were a 1970s-1980s staple…but ironically, I don’t think we had them in our house! Either way, it was obvious to me that people were cleaning out their cupboards and adding these old wicker paper plate holders to their donation piles. They’re really begging to be repurposed aren’t they? Inexpensive, easy-to-find, and a plain/simple canvas for a new beginning. This post contains affiliate links for your crafting convenience. And for me, a lot of new beginnings involve spray paint. For this project? Krylon’s pumpkin orange spray paint…emphasis on the pumpkin. Once the paint dried, I grabbed some scraps of felt from my stash- a mottled green for the stem, and black for the jack-o-lantern face…all of which I cut out free hand. Oh, and some fabric glue to attach my felt pieces to the now-orange wicker. I mean, come on- how cute is that?? Ok, it’s official- I love it! He needed a few more embellishments, so I purchased some “silk” leaves to give him that “just picked” look. And yes, I realize the leaf shape is more oak-y than squash-y, but I loved the autumn colors and the hints of shimmery gold. I already had some curly-q dried grasses on hand that I had used in my summer jars, so I spray painted them green and added them to the mix. When all was said and done, I had a charming little decorative piece. Thanks to the open weave of the paper plate holder, I was able to slide a piece of thread through the back (behind the stem) and tie off a little loop- perfect for hanging on a door! 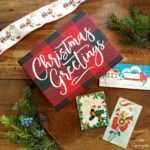 Maybe not quite as cute as the vintage cardboard decorations my mom would use around the house all those years ago, but definitely cute enough…especially for the price AND for the simplicity of the project! 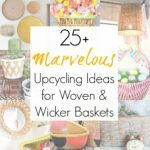 Now I really want to make more projects with these wicker holders to use during different times of year…hmmm…what would you suggest? And if you’re looking for more Repurposed/Upcycled Halloween project ideas, check out my full collection here! This is great! I see these at thrift stores everywhere, heck, I even inherited a stack in the second house I bought. Perfect reuse. Love the felt touches and I think the maple leaves look just fine. I grow a lot of pumpkins and squash and they look pretty close. That is just adorable! Pinning this one to my Pumpkin Everything board! Adorable – you come up with the greatest ideas Sarah! Great idea. I love this cute pumkin. What a cute idea and so easy too. Thanks for sharing your tutorial at Vintage Inspiration Party. Thank you so much, Mimi!! What a cute and easy project! I love this. Thanks for sharing at Inspiration Thursday! So cute! We had ’em too! And I used them as a young married! Thanks so much for joining and sharing this really cute pumpkin craft at Cooking and Crafting with J & J.
I am now following you also besides IG on Bloglovin, Pinterest, and Twitter. This is the cutest pumpkin ever!!! Love it! You are so creative! I would have never thought to do this. Would love if you shared this on the Spooktacular Link Party. Such a cute re-use idea! Thanks for sharing! That’s what I was thinking, too, Ann- or oversized ornaments! Hi Sarah, These are absolutely adorable! Love your diy. Thanks for sharing at the Inspiration Spotlight Party. Pinned & shared. Super cute and a great project to do with the kids! Featured at Be Inspired this morning. Thanks so much for sharing! Totally!! You are so welcome, Sherry! Love this idea!!! Simple, easy and oh so cute! I love this! So cute and creative! Again, I love your eye for seeing creative designs. My parents definitely had plastic versions on these when I was growing up because they bought really thin paper plates. So cute! I have a question – how do you take your photographs, for example, the ones with the white backgrounds? Thanks! Also – thank you for linking up at Welcome Home Wednesday! Hey, Brittany- I bought a large white vinyl backdrop that I set up in front of my kitchen bay window. I don’t use any artificial light, but I still get shadows since the light only comes in from the right. But that white vinyl makes a world of difference- bought it on Etsy! Very cute!! We use these and bought them at Walmart which sells them each summer. The thin paper plates are easily biodegradable, and have no plastic coating, so I’d rather use those for pizza night. I’m making a bunch to put over my archway! Love it! This is so cute and creative! Great job! A great price and a simple project are a crafting match made in heaven! Cute idea! Pinned and shared. 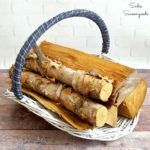 Oh gosh I remember those wicker plate 😉 I love this project… what an adorable way to reuse the crazy plates!! Thanks you so much for linking this up to our Inspiration Galore Project Party last week… you are one of my Features tomorrow over at http://www.recreateddesigns.com. Pinned and shared. Happy Halloween! Sarah, what a cleaver idea. I have a bunch of those basket plate holders laying around. Share you for sharing at Your Inspired Design. Very cute idea and looks pretty easy. My favorite kind of project. Thank you for sharing at Vintage Charm. Definitely cute and I love a re-purpose project!! Thanks for linking up at Shabbilicious Friday. OHHH, I wish I had seen this before I went to the thrift store today! That’s so cute! Simply adorable – I have those old paper plate holders and will make these!